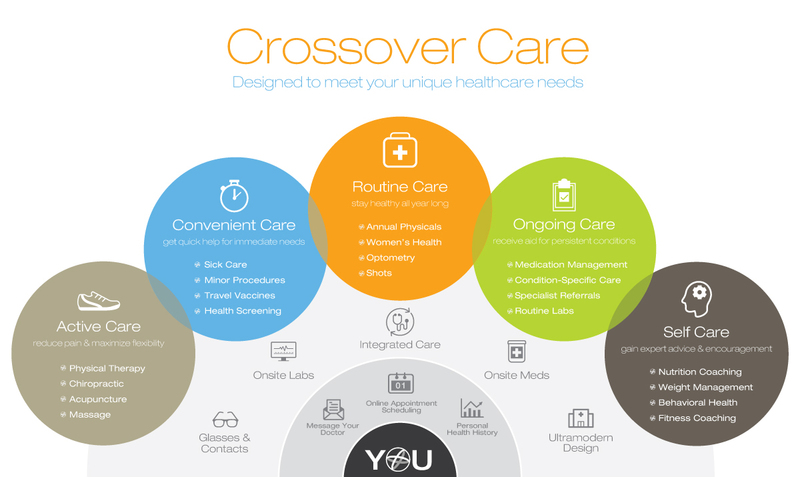 Crossover is a doctor-led team of caregivers helping with all of your medical and health needs under one roof. You and everyone on your care team work from the same information, so your care is coordinated, informed, personal and seamless. Convenient hours? Yep. Same or next-day appointments? Of course. Online scheduling and prescriptions? Done. Multiple locations? Uh huh. Remote access to caregivers? Yes, available 24/7. Connect to your healthcare wherever, whenever, with the Crossover App. Our beautiful health centers are designed for one thing – to put you at the center. That’s what modern healthcare is all about. Who would have thought that personalized care, extended services and ultimate accessibility would come with the best pricing in the Bay Area? Now you know. We work hard to get to know you well, to help you take the steps to get to the next level of health, and help you succeed in your health goals. See for yourself what belonging to great healthcare can do for you.